Pets are like humans. They have allergies to all sort of things – including food. By being exposed to the same foods over and over, some sensitive dogs or cats can develop allergies. The most common food allergens for dogs and cats are chicken, beef, corn and wheat. Not so coincidentally, these food products make up the top ingredients in all commercial pet foods. And it’s harder to avoid them than you might think. Fish flavored chicken. Even when a pet food is labeled as “fish,” you may find that the primary ingredient is fish-flavored chicken. You’ll also find lamb-flavored beef or chicken when you read the small print closely. So read the label, then read the ingredients to know what your pet is really eating. Allergic reactions. Food allergies may manifest in symptoms ranging from itchiness to respiratory problems to digestive woes. 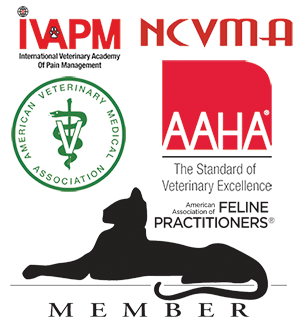 If your pet suffers from a chronic problem, talk to us. We’ll help you narrow down the culprit, and come up with a plan to help ease the problem. a. Instinct. Rest assured that this pet food line contains very limited ingredients and is grain-free. Ingredients include exotic proteins like rabbit, duck and bison. b. Purina HA. Depend on hypo-allergenic dog food available by prescription. c. Hills ZD. Change to a pet food with hydrolyzed (or broken down) protein which is easier to digest and available by prescription. 2. Conduct a food trial. a. When you switch foods, your pet needs to be fed the new food exclusively for 8-12 weeks. You can’t give treats, and you can’t slip them anything under the table. By feeding them the new diet, you’re essentially detoxing your pet’s digestive system. b. After the prescribed time (8-12 weeks) give a piece of chicken (or the suspected food) and see if they react. It will take a little detective work and probably some slight changes in diet, but it will pay off in the end. In the meantime, we’ll suggest things that can help your pet feel much more comfortable. And that will make you more comfortable, too! 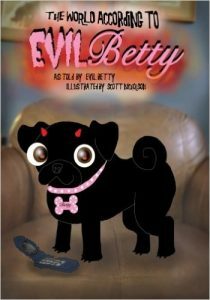 Evil Betty Demon Black Pug from Hell is a famous (or infamous!) Pug who lives with Claire King right here in Burlington, NC. She’s an internet sensation, a budding stage actor, and now – she’s written a book! Born three years ago in Sparta, North Carolina, Evil Betty’s debut into society stemmed from Claire’s frustration on how her new puppy chewed up absolutely everything. Claire started a Facebook page to share (or vent!) about all the things that had been destroyed by the tiny little package of loveable cuteness. Last fall, Evil Betty was the star (ask her, she’ll tell you) of Urinetown, the Musical. Several of her cast members began discussing Evil Betty’s ego, and how much bigger it had become since her stage debut. The more they talked, the more they realized that Betty’s voice needed to be heard by the masses. Thus, it began. Evil Betty agreed to write the book, and share all about her world that we live in. Scott Nicholson agreed to illustrate. And in March, 2016 “The World According to Evil Betty – Volume 1” was published. Once you see the world through Evil Betty’s eyes, you’ll never be the same. Because, despite her name, the Demon Black Pug from Hell isn’t evil at all. She’s a wonderful personality that will warm your heart and put a smile on your face. You can purchase your copy of Evil Betty’s book on Amazon.com, or you can get an autographed copy on Etsy. And while you’re waiting for your book to arrive, you can follow Evil Betty on her Facebook page. Evil Betty has several publicity and charity events lined up, including a book signing at Town N Country. Speaking of Town N Country, we’re pleased that we’re a part Evil Betty’s world. We’ll keep you posted about when you can meet our wonderful friend. We know that you’ll fall in love with her like we have done! Yes, Fleas?? No, Thank You! Cute doggies and cats — their favorite diet. Looking for fresh blood — why can’t they just buy it? Fleas, Bloodsucking fleas! Horrible Fleas! Fleas. They’re the number one cause of allergic reactions in cats and dogs. Fleas are a menace year round, but the warmer spring weather means your pet’s more at risk. If your pet’s been scratching a lot lately, it could be fleas – even if you can’t see them. A single flea can make your pet itch miserably. Plus, some pets are so skilled at self-grooming that they lick away any physical evidence. All you’re left with is the after-effect of a highly irritating allergen. Take a closer look for tiny red bumps, especially at the neck, the tail or anywhere hair is thin. 1. Shut that mouth. Trifexis®. paralyzes the flea’s mouth within 30 minutes when it bites your treated dog. Effective for 30 days, it also protects your dog from heartworms, roundworms, hookworms and whipworms. 2. Put a Cap on it. Capstar® is a similar product to TrifexisR but its effectiveness lasts only for 24 hours rather than 30 days. Talk to your vet about what’s best for your pet. 3. Stop the reaction. Apoquel® is an drug that acts in the skin to stop the itch. Read more about it here. 4. Attack outside and inside. Environmental treatment for your house and/or yard may be recommended, depending on your individual case. 5. Keep it consistent. Vectra 3D® provides broad spectrum protection against ticks, mosquitoes, lice, biting flies and fleas. A highly allergic pet may need this type of long-term, consistent protection. 6. Treat the symptoms. If your pet’s dealing with watery eyes, dermatitis or itchiness, antihistamines, steroids, antibiotics or antifungals can help your pet feel more comfortable until the fleas are completely gone. Did you notice that flea shampoo didn’t make the list of solutions? That’s because flea shampoo only gets rid of fleas temporarily. Nothing prevents a fresh batch of fleas from jumping on your newly cleaned up pet. If you suspect your dog or cat might have fleas, give Town N Country a call. A simple assessment can determine what’s going on and establish the best solution for your pet’s relief and good health. Help your pet say “No, thank you!” to pesky, blood-sucking fleas, and sing a healthy, happy song instead!